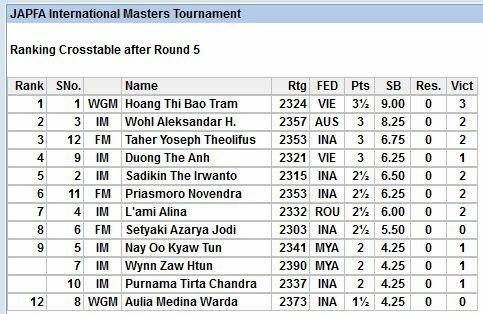 It is still another six more rounds to go but it is clear that 6/9 will be enough for an international title norm so some will already be looking to get there in the next four rounds. With few exceptions, the games so far have been hard fought. 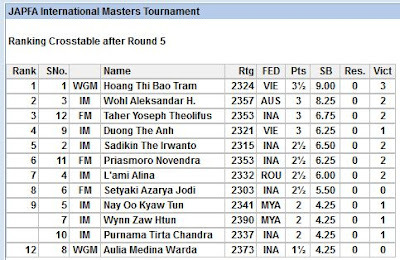 In the International Masters Tournament, and of the local candidates for title norms, Taher Yoseph Theolifus has best ridden his luck while the highly thought off Priasmoro Novendra has been very much up and down and Setyaki Azarya Jodi can probably be happy with his five draws! 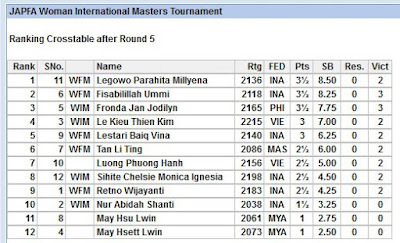 The International Woman Masters Tournament has a very impressive Legowo Parahita Milleyena and her good friend Fisabilliah Ummi who has been hanging in there, look the best title norm bets. 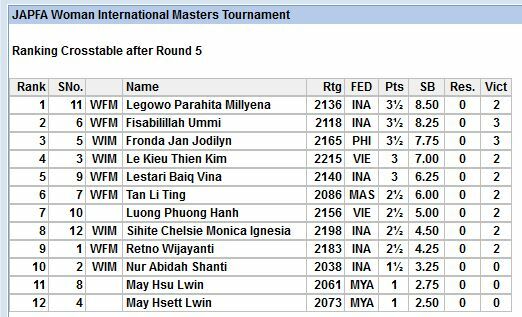 It was, however, a bit of a heartbreak for Malaysia's Tan Li Ting who looked to all but score an important win in the fifth round and join the leaders on 3.5/5 but in a time scramble not only threw away the win but even lost. Well, it's not the end of the world and I am sure she will pick herself up and get back into contention.